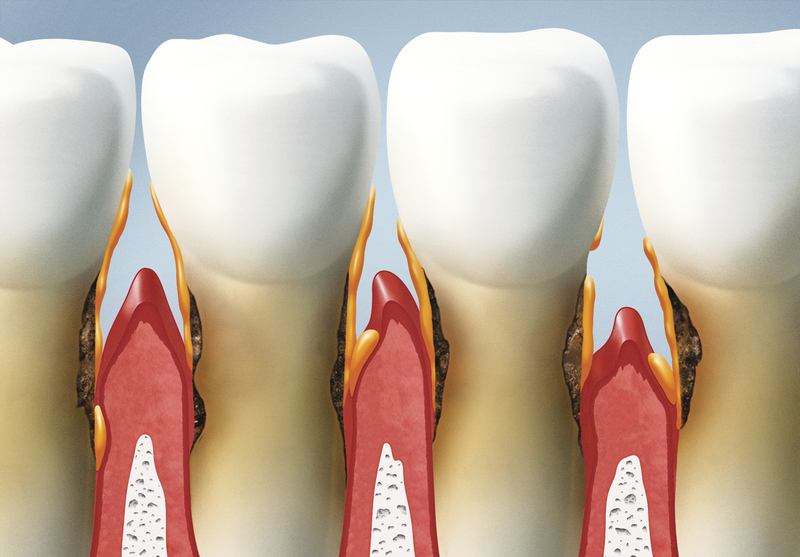 Periodontics is the branch of dentistry concerned with the structures surrounding and supporting the teeth. This specialty focuses exclusively in the inflammatory disease that destroys the gums and other supporting structures around the teeth. How Do I Know If I Need It/Symptoms ? Gums that are red, swollen or tender. Bleeding while brushing, flossing, or eating hard food. Receding gum lines, causing the teeth to look longer than before. Evidence of pus between your gums and teeth. Change in the fit of dentures. Gum and Bone Disease : The disease destroys the healthy gum attachment to the roots of the teeth, leading to gum infection, gum recession, bone loss around the teeth and halitosis (bad breath). Flap Surgery : Flap surgery, as the name signifies, is a dental procedure done by periodontists to flip the gingival flap, expose the root and perform cleaning and reconstructive procedures. This will help to minimize and remove any periodontal pockets. Laser Assisted New Attachment Procedure : The laser works initially in the space between the gum and the tooth (periodontal pockets) to kill bacteria inside of the pocket, which was the source of the problem. The laser can see the difference between healthy and diseased tissue and selectively destroys diseased tissue, and can see where the bacteria is and specifically kills it as well. Mucogingival surgery : Also named as periodontal plastic surgery “Surgical procedures performed to correct or eliminate anatomic, developmental or traumatic deformities of the gingiva or alveolar mucosa”.